This skittish species is a moderately rare butterfly in Singapore, but can be seen in areas where its caterpillar host plant, Uncaria sp., is found. Usually found in forested areas, it can be approached much easier when it is feeding, particularly on the ripened fruits of the Singapore Rhododendron (Melastoma malabathricum). The wings of the Colonel are orange above with dark brown stripes and markings. 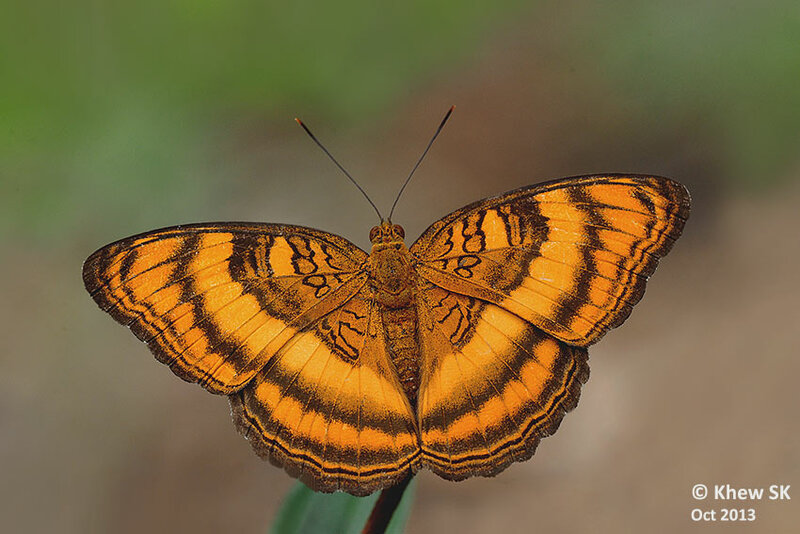 The underside is paler orange but the basal area of the wings are a greenish grey. This individual was shot whilst it was distracted when feeding. It is usually very alert and has a wide circle of fear. When alarmed it takes off to the treetops and perches in a safe location on the top of a leaf. Its life history has been fully recorded in Singapore and can be found here.